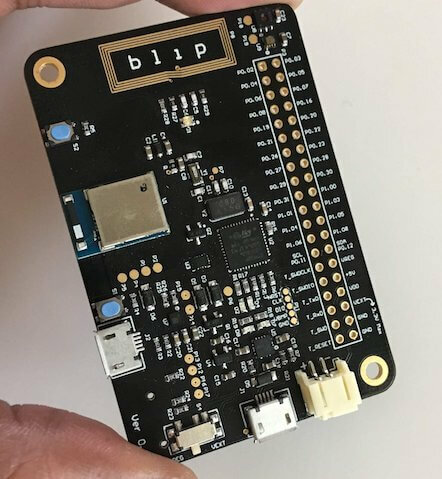 More information about the board is available at https://github.com/electronut/ElectronutLabs-blip. Blip has two external oscillators. The frequency of the slow clock is 32.768 kHz. The frequency of the main clock is 32 MHz. BMP does not support hardware flow control, so only RX/TX pins are connected. MicroSD is connected to these pins, and CS pin is connected to P0.17. Applications for the nrf52840_blip board configuration can be built and flashed in the usual way (see Build an Application and Run an Application for more details); The onboard Black Magic Probe debugger presents itself as two USB-serial ports. On Linux, they may come up as /dev/ttyACM0 and /dev/ttyACM1. The first one of these (/dev/ttyACM0 here) is the debugger port. GDB can directly connect to this port without requiring a GDB server by specifying target external /dev/ttyACM0. The second port acts as a serial port, connected to the SoC. Applications are flashed and run as usual (see Build an Application and Run an Application for more details). Replace <tty_device> with the serial port of Black Magic Probe. For example, under Linux, /dev/ttyACM1. Debug and attach configurations are available using Black Magic Probe, and ninja debug, or ninja attach (or with make) are available. You can build and flash the examples to make sure Zephyr is running correctly on your board. The button and LED definitions can be found in boards/arm/nrf52840_blip/nrf52840_blip.dts.